NHL 62" Double Canopy Umbrella (Select NHL Teams Available) - $32.95 - GolfersEdgeOnline.com - Best Golf Equipment On The Web! 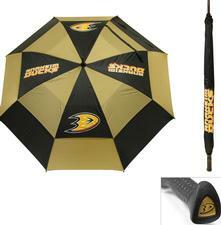 Protect yourself from the elements in true NHL style with the Team Golfs 62" Double Canopy Umbrella. This umbrella withstands strong winds and features multi-colored panels with a full-color durable imprint. The easy-grip molded handle fits comfortably in your hand for complete control. Keep yourself dry on the course while showing all opponents who your favorite hockey team is with the Team Golf Umbrella. If you have any more questions about the NHL 62" Double Canopy Umbrella (Select NHL Teams Available); do not see the model you are looking for; need custom options; or prefer to not purchase online, then please call us at (630) 656-1291.